A curious habit, denoting the purchase date inside every pair of shoes, might be regarded as an untreated obsessive-compulsive disorder by some. Having done this regularly for fifty years, I find the data to be both interesting and informative, and therefore offer no excuse. What might require psychiatric evaluation is the need for women to own fifty pair or more when men easily shuffle through life with less than ten. Few men, if any, have a poster of Imelda Marcos hidden in their closet behind the girlie mags. Her husband Ferdinand, the now deceased despot of the Phillipines, probably slept in a separate bedroom located adjacent to Imelda’s shoe warehouse. I digress. Forget the popular vintage collectibles, i.e., wine, cars, clothing, trailers, yada, yada; an event this important requires vintage shoes. I have selected the non-slip sole, tan, two-eyelet version by Bass, purchased on May 20, 1987. Not the upscale Sperry Topsiders, favorite brand of the erudite East Coast, blue-blazer, white-trouser snobs who actually have boat(s). In its dormant state, unlike a long ago, opened jar of preserves that disavows the meaning of preservation, an old trailer and an old pair of shoes need to “jam”. Or so we have been led to believe. So Lynn, dog Jack, and I will be there to report the activities in Saratoga, like that popular news channel…..unfair and unbalanced. Be assured your BS polygraph will be chirping like a nine volt smoke detector or that neighborhood garbage truck driving in reverse, but the shoes are real. How often do you spend thought on any common household implement ? A week in Oklahoma, everywhere you look, the image of the state bird, a scissor-tailed flycatcher stares back at you. 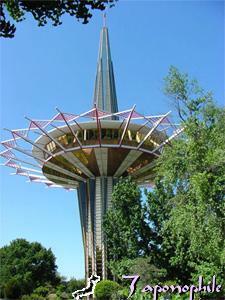 A brief drive through the campus of Oral Roberts University reveals ghastly gold-plated tasteless buildings, as if the architect was Edward Scissorhands himself. I am confronted by The Praying Hands sculpture, an institutional landmark, probably wishing for a new pair of Wiss embroidery shears. Prayer was obviously not in play if you were on this design committee. A bunch of cut-ups, I imagine. This is, we’re told, the Bible Belt. Alert, alert, simply not true. This is the bib overall, britches, and bow-tie belt. Alliteration aside, I did meet one nice Jewish fellow on the campus, in this den of Christianity, but he, too, was a writer from Washington D.C. We laughed as we shared a bottle of Visine-AC drops in an attempt to reduce the irritating glare; surrounded by dreadful design. The most common seafood in Oklahoma is not bluegill or perch, it is the Jesus Fish. Home to reputedly the oldest adult theater in the U.S., there are probably more sinners in T-Town than religious TV stations, but the gap is narrowing. The native American influence is as common as the reminder on the Oklahoma license plate…..Native America. I learned five new Indian entries for the vocabulary while in Tulsa: Okmulgee, Savage, Chickasha, Catoosa, Keno, and Bingo. So I miscounted, but remember I’m from Indiana. We learned math too, but never beyond calculating 8.517 % sales tax. It’s as if Pythagoras was reincarnated to Ponca City to teach arithmetic. Where on earth did the Okies ever come up with a number like that ? I leave Tulsa feeling enriched by the wonderful people we met. To you literary purists, yes, I did make up that stuff about Will Rogers, but it is something he might have said. It is never good to lie, but sometimes you just have to make up the truth. I will come back to Tulsa, much sooner if invited, to monitor your progress. And have another dish of cold water at Arnie’s. For the lovely silver hairs at the state welcome center, you really ought to reconsider on the milk-bone thing.